Telstra today commercially launched the first mobile broadband device to work on its newly branded "4G" network and has promised to deliver 4G smartphones and tablets in the first half of 2012. 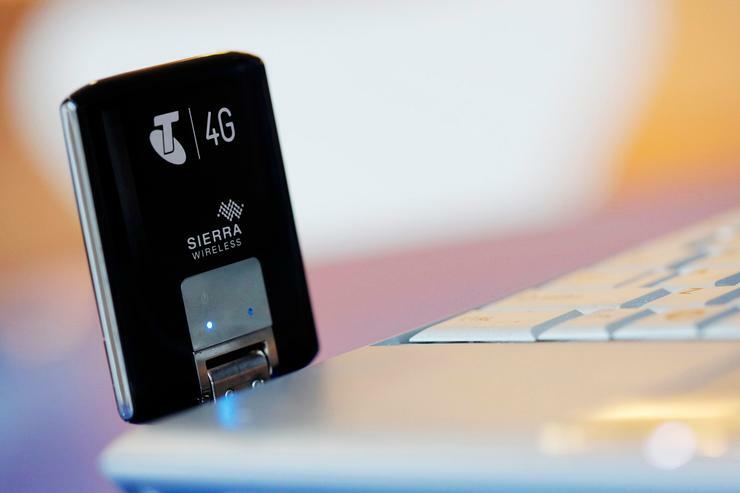 The Telstra USB 4G modem is the first device to work on Telstra's Long Term Evolution (LTE) network, an "LTE enablement of the Next G network". The 4G LTE component compliments the existing Telstra Next G network and promises to deliver faster uplink and downlink speeds along with higher latency. It will operate on the LTE 1800MHz spectrum band, which was previously used for 2G services. The Telstra USB 4G modem goes on sale across Australia today, with initial "4G" coverage stretching across all eight capital cities and their respective airports in Australia, along with 30 out of a possible 80 regional and metropolitan centres. If 4G is not available, the device will "switch across" to the regular HSDPA+ Next G network. Telstra says the 4G LTE network will approximately double download speeds and triple upload speeds compared to its regular Next G network. The company is quoting typical download speeds of between 2 megabits per second (Mbps) and 40Mbps and typical upload speeds of between 1Mbps and 10Mbps. "We see this as another string in our bow to provide an even more reliable network," said Anthony Goonan, Telstra's director of network and commercial planning. "The additional capacity that 4G technology offers allows us to continue to provide a reliable network for our customers." Telstra says its 4G LTE coverage will span 5km from capital city GPOs (General Post Office) and 3km from regional and metropolitan GPOs. Amongst the metropolitan and regional areas to currently boast 4G LTE coverage include Albany, Broome, Dubbo, Nowra, Singleton, Orange, Mt Isa, Devonport, Victor Harbour and Ballarat. Goonan said Telstra will continue the LTE rollout into other coverage areas "where demand requires the extra capacity". The telco has also promised to enable 50 further locations by the end of the year. In addition to the USB 4G modem, Telstra also announced that the first LTE smartphone — the HTC 4G Android phone — will be available in first half of 2012. The telco refused to reveal specific details but the working model shown to journalists yesterday is believed to be the HTC Raider 4G: an LTE capable Android phone which just launched in South Korea. The HTC Raider 4G has a 4.5in qHD screen, a 1.5GHz dual core processor, 1GB of RAM, 16GB of internal memory and an 8-megapixel camera with dual-LED flash. Telstra has also promised LTE tablets in first half of 2012, but provided no further details aside from saying most device manufacturers "have committed" to LTE. Telstra's 4G LTE modem will be sold in two variations: the Telstra USB 4G modem for business customers and the BigPond USB 4G modem for personal users. Both modems are identical aside from the branding. The BigPond USB 4G can be purchased by consumers for $0 on a $49.95 per month plan with 4GB of data (over 24 months), while the Telstra USB 4G can be purchased by business customers for $0 upfront on the $39 Telstra mobile broadband standard plan with 4GB of data (over 24 months). For more information on plans, visit Telstra's Web site. Today's commercial 4G LTE launch follows a test of the USB 4G modem for 2000 selected business customers last month.